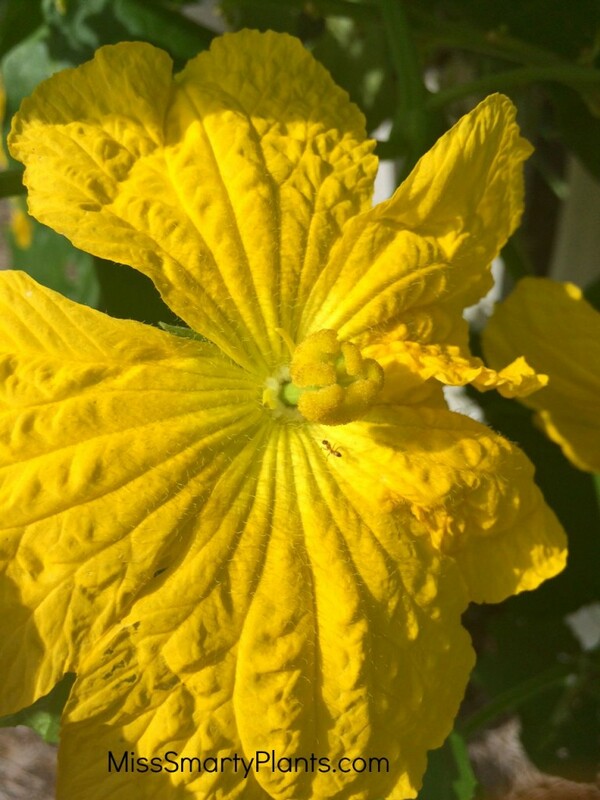 When my cucamelon vine failed to produce any fruit in the past season, I decided to take matters into my own hands and do some hand pollinating. As I was talking about this to a friend I could see the puzzled look come across her face. “How do you tell the female flowers from the male flowers?” she asked. Good question! Now not all plants will have separate female flower and male flowers. In fact it isn’t many at all, but the ones that do are important to us agriculturally. 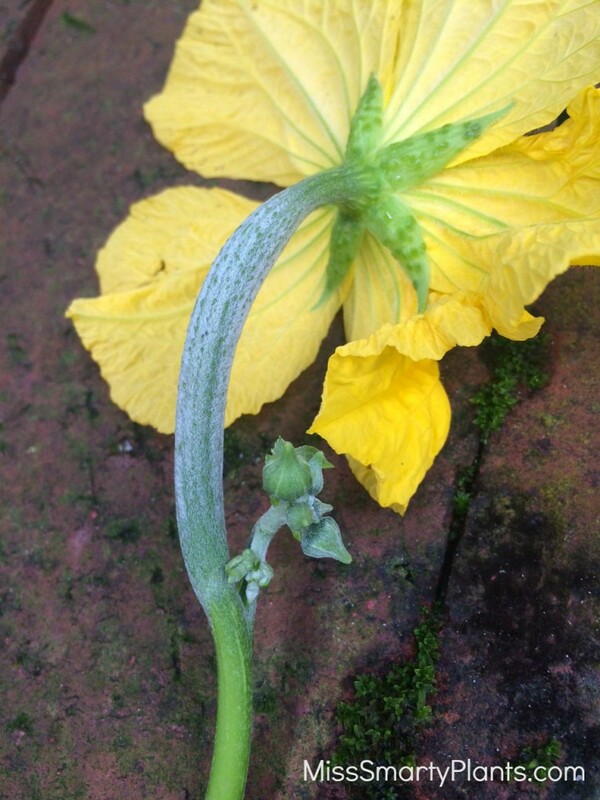 All of the plants in the Cucurbit family will have separate male and female flowers on the same plant. This includes cucumbers, loofah vine (shown above), watermelons, squash, zucchini, and of course, my little cucamelon vine. The term “monecious” means that one plant will have both male and female flowers rather that one type of flower with all of the reproductive structures. Other plants that are monecious include corn, oak trees and figs. I digress, back to the flowers! In this photo of the female flower on the loofah vine you can actually see what looks like a small fruit right behind the flower. 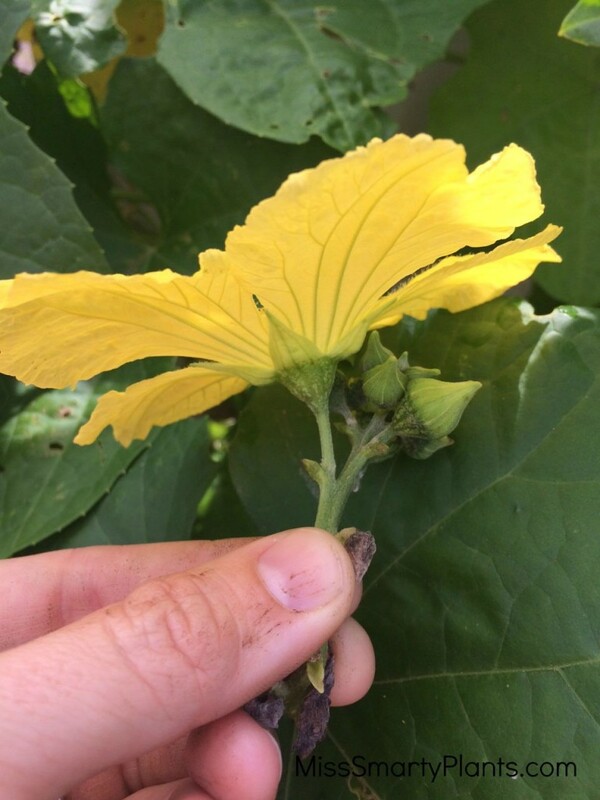 If pollination occurs, this little fruit will start to develop and grow on to become a mature loofah. If the female flower does not get pollinated, it will just shrivel away and fall off of the vine. 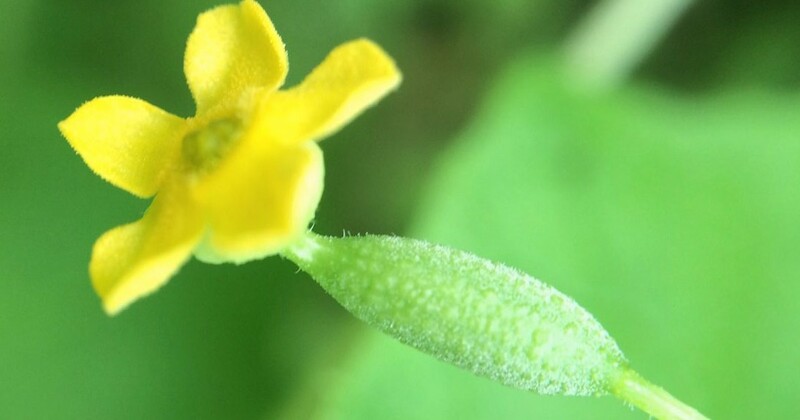 The front of the female flower shows the long sticky stigmas in the center that will collect the pollen and lead to the development of the fruit. It is much easier to tell the female flowers from the male flowers by examining the back of the flowers, but I still think it is worth showing. The photo above shows the male flower of the loofah vine (these are great flowers to demonstrate with– see how large they are!). Notice that there is no “baby fruit” behind the flower on the male flower. There is likely to be a group of male flowers together, whereas the female flowers are often spaced out and not nearly as abundant. If you are going to hand pollinate, you can take off the entire flower and then rub it on the female flowers. From the front you can see all of the pollen-covered anthers on the male flower. This pollen has to be moved, by bees or by hand, to the female flower for successful pollination and fruit development. If you aren’t sure, go ahead and touch those center parts; the male flowers will leave the yellow pollen on your fingers. 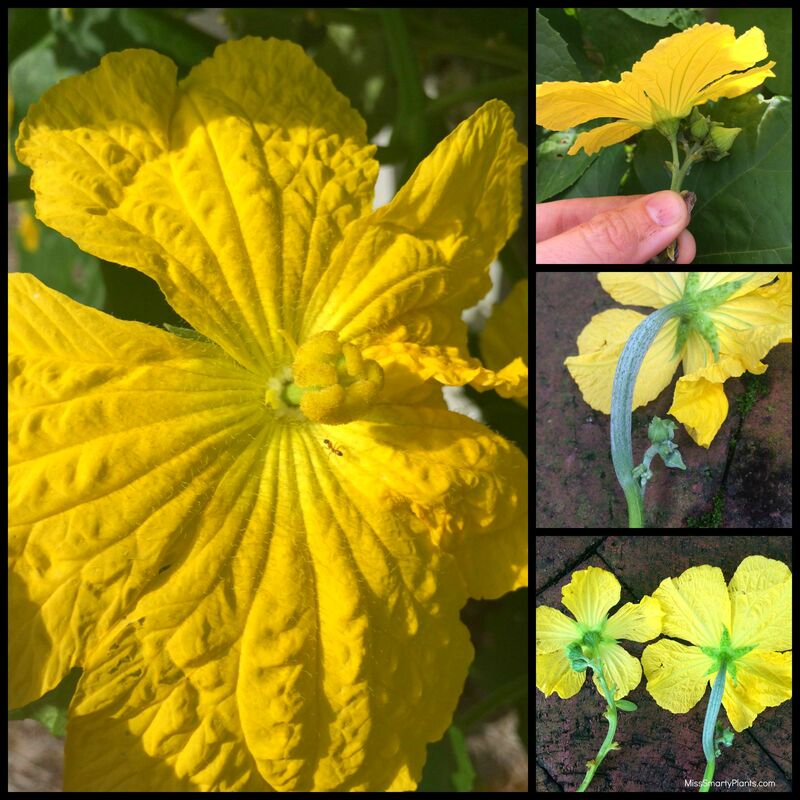 Its fairly easy to see the males from the female flowers in these large loofah flowers, but what if you are dealing with teeny, tiny cucamelon flowers? 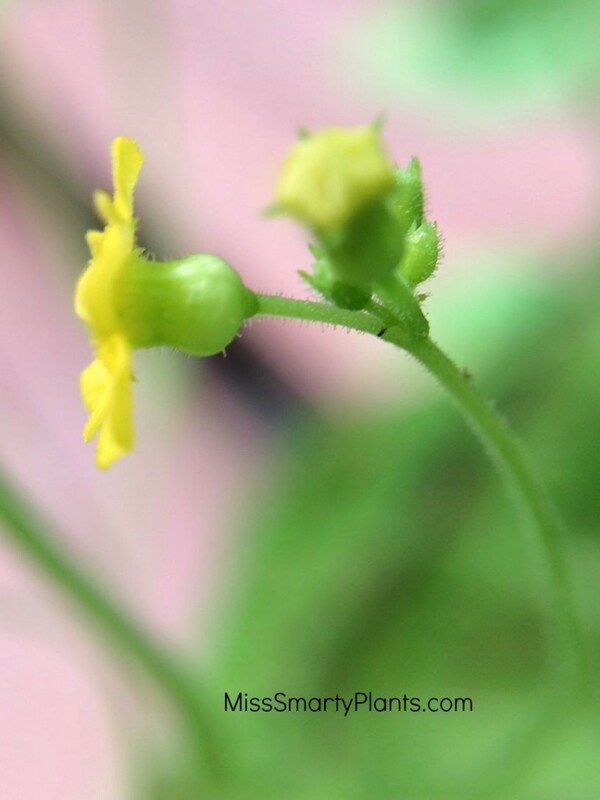 Even though it is only about the size of a pencil eraser, this female flower on the cucamelon plant still shows a prominent “fruit” behind the flower. I make sure to note these so as I pull off the male flowers to pollinate I will be able to get to each one. 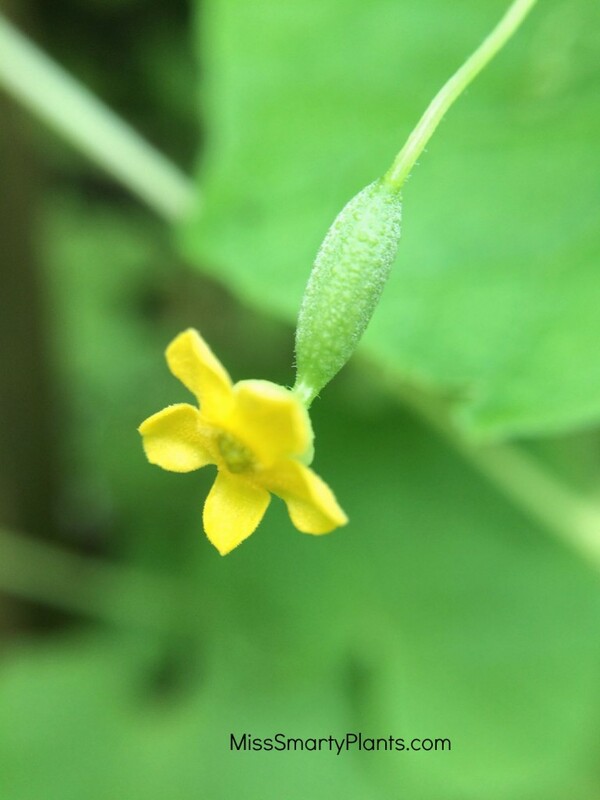 The elongated immature fruit behind the flower is easy to see, even on these little female cucamelon flowers. The male flower, shown above, can be a little deceiving with the sort of bulbous base. 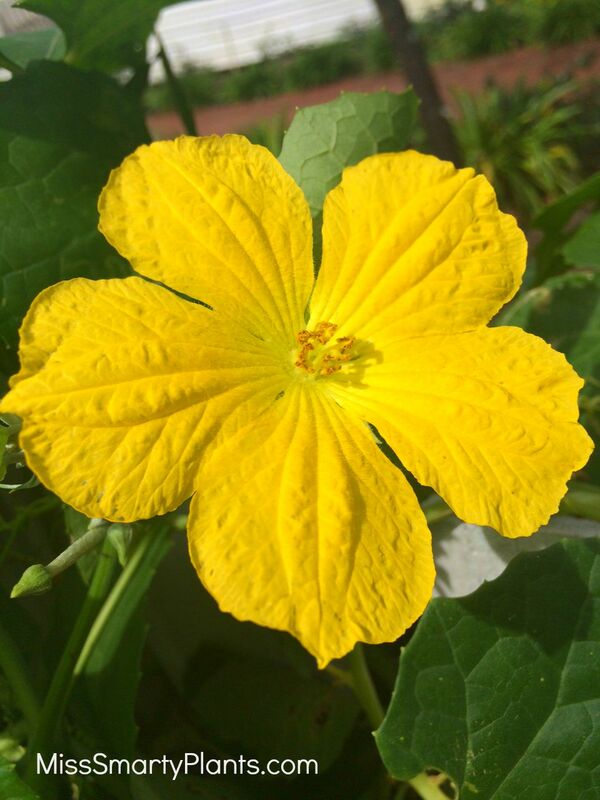 But once you find a female flower it is very clear that is not an immature fruit but just the shape of the male flower on the cucamelon vine. When I hand pollinate with these I pull the entire flower off and remove the petals to make it easier to rub on the female flower. Telling the difference between female flowers and male flowers isn’t complicated, but it takes a little patience to get started. 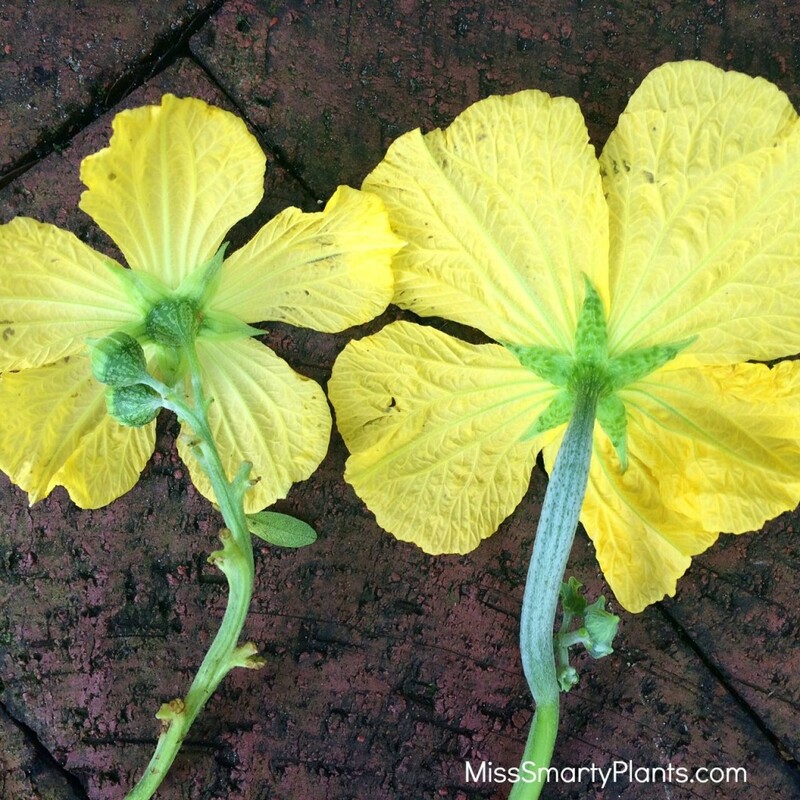 Knowing how to tell these two apart will make you a better gardener and increase your harvests!